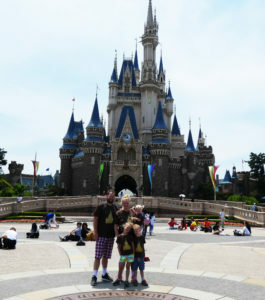 Of all the Disney parks in the entire world, Tokyo Disneyland is our family’s favorite (see our rankings)! 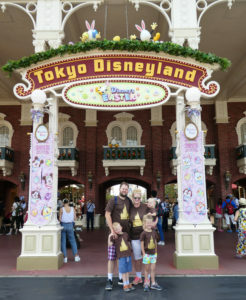 Tokyo Disney offers two parks, Tokyo Disneyland and Tokyo Disney Sea. The property as a whole is unique in that all the other Disney properties are set apart from the mainland. In Orlando you have to enter a compound, quite literally. At Hong Kong and Shanghai you must complete an epic journey before you arrive at the entrance, while in California the park is completely shrouded from outsider’s eyes and ears. But here, you take the the main Tokyo Japan Rail straight to the park and as soon as you get off, the park is gleaming before your eyes. It is also quite unique having not only four Disney park hotels to chose from, but several partner hotels located within the monorail line and within the property boundaries. We opted to stay at the family budget friendly Celebration Hotel. Read our review! The Disneyland park itself is nearly identical to California Disneyland with similar rides, and a similar layout. The differences are pretty inconsequential, with a few key notations, and that is what matters here, particularly when so much is the same. After exiting the subway station, the first thing you see is the monorail go by. It circles around one continuous loop, with two trains, and is open to everyone. Watching the monorail go by, we could see the conductor leaning partially out of the window waving at all the guests. Eagerly, we waved back and as soon as the conductor spotted us, he immediately popped both arms out of the window and even more energetically and excitedly waved and saluted us with a smile across his face until he was out of sight. And that specifically is what makes Tokyo Disneyland stand out above all the other parks. The magic exudes from the cast members and it is infectious. Upon entering the gates, characters are everywhere! From a very scary Fairy Godmother, to Tweedledee and Tweedledum, to Jiminy Cricket and Pinocchio, to the Aristocats. It felt like we saw more characters here in 3 days than in our past 7 annual trips to WDW combined! Every one of the was interested in seeing and visiting with the children, conversing with them, listening to jokes and asking about their visit. It was nothing short of magical! Beyond this atrium, guests pass through a large shopping hall outside of which lies the immense castle poised over her kingdom. She’s the 3rd tallest Disney castle, but her placement makes her breathtaking. The castle courtyard is immense and guests use the grounds to picnic, relax, and enjoy the ambiance of the Happiest Place on Earth. Our children loved running around in circles and up the stairs. The food at Tokyo Disneyland is pretty disappointing. You’ll find mostly Quick Service restaurants offered here, as opposed to Table Service on the Disney Sea side. I had hoped for similar offerings the likes of Hong Kong Disneyland, but this was pretty substandard typical theme park food. I read gads and gads of blogs and articles about the cute character food, and how it is as delicious as it is cute, but we did not find that to be the case. 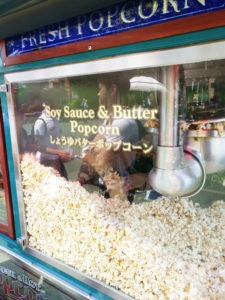 What they do have, is flavored popcorn, and it lives up to the hype. Not necessarily because it’s so yummy, but definitely because it’s so weird. In total there are 10 flavors to try, and we sampled all the popcorn flavors,… Yes, Every. Single. One. We may not have been partial to the cute food, but we were still bombarded by cute everything! From clothing and merchandise, to signs and posters, to characters and parades. We were fortunate enough to visit during Easter celebrations which run from March until the end of May. The celebrations include Easter themed eggs hidden all over the park, including the rooftops and inside the rides, Easter themed food, and most importantly the ‘Usatama on the Run!’ parade. The Usatama are Easter eggs that got mixed up with bunnies in the factory somehow and the factory workers are on the hunt to find them. It’s crazy weird, and that’s Japan for you. 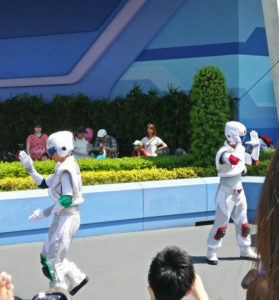 The parade has a whole dance that goes with it, and every Japanese Disneyland fan knows it. The music, the jumping and leaping, the attention to detail, it’s all there. It’s all front and center and it’s sensational. It’s impossible not to get caught up in it all. Coincidentally, we also visited Hong Kong Disneyland during their Easter celebrations, but beyond a Disney themed Easter egg hunt there was nothing quite as festive. 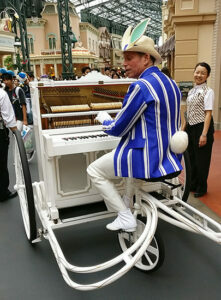 Parades take on a whole new level of intensity at Tokyo Disneyland. You will see guests staking out spots hours ahead of time. They sell special blankets to sit on while you wait said hours. We certainly love the parades, but we aren’t willing to give up hours at the park…, so we watch from behind. Everywhere you looked, you could find two things – and they are both equally as important. 1. People wearing matching outfits, and 2. Bathrooms. Before spending a week in Tokyo, we visited the park first. We thought the matching outfits were unique to the park, but it turns out it’s rampant all over Tokyo. 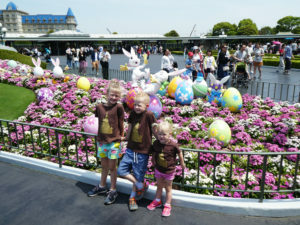 Tokyo Disneyland takes this to a whole ‘nother level and it was decidedly one of our favorite aspects of our experience. The bathrooms are truly glorious! No waiting in lines, no praying to find one while dancing through the crowds hoping to avoid an accident, no lame searching cursing the sky. Look left, or look right, there will be one in either direction. And finally, the language, which you may think this is obvious, but try spending 3 days not understanding anything and it’ll feel quite prominent. All the shows, rides, and commentary is in Japanese. The ride signs are in English, but that doesn’t help. For the most part, it seemed pretty obvious that all the commentary was the same, particularly the Jungle Cruise joke about the back side of water. Our kids didn’t seem to mind. They immersed themselves in the non-verbal storytelling and loved it every bit as much. For our entire family, our favorite ride in this park is the Winnie the Pooh ride. It was unique, exciting and better in every aspect than its counterparts. We were surprised they used the old model form for the Shanghai Disneyland park rather than this updated version. ► For Kids: It’s got Disney in the name. This place is built for kids! Our kids loved having characters literally at their disposal without the long torturous lines to get to see and talk to them. The rides are similar with a different twist, and they thought it was fun to compare the similarities and differences to the American versions. Our children enjoyed the fully immersive nature of this park, and thought it was even more special than any other park they have been to. 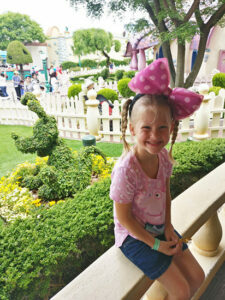 Read about our experience at Tokyo DisneySea! ► Nap-time Version: Of every Disney Park in the world, this is our favorite. The food isn’t as wonderful as we anticipated, but the rides were incredible, the castmembers were top-notch, there are bathrooms around every corner and characters everywhere!